My preferred database is Postgres, but you can use the database-agnostic connection and there are all reasons for it to work well in read-only mode. I’ve tested it myself with Oracle. If you need Spreadsheets and your company is using Oracle, we redirect you to Heroku Postgres, so you can host your database online. Having tried it, there is no significant delay in using a cloud database provider. 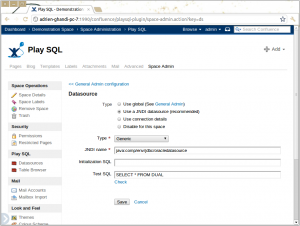 In this article, I’ll show you how to provide Confluence with the JDBC driver of your choice, declare the JNDI datasource and use it in Play SQL. Download Oracle’s Thin Driver, for example ojdbc6.jar. Put the driver in Confluence’s /lib directory. You can click on Check, and it will display the result of your Test SQL query. Your datasource is ready! Copyright Adrien Ragot 2014. All Rights Reserved.